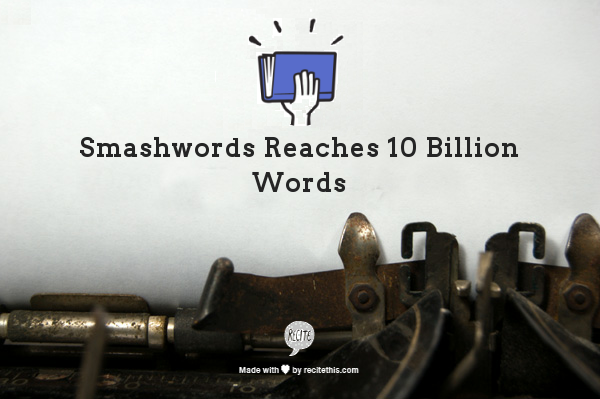 Smashwords authors today reached an exciting milestone: 10 Billion Words Published. The milestone was reached sometime around noon Pacific. These words come from 87,000 writers from every corner of the globe who have gathered together to change the world of publishing one ebook at a time as manifested through their 288,000 titles at Smashwords. These writers are revolutionaries and saviors of the written word, even if they don't view themselves as such. They're leading the indie author movement. It took about 50 months for us to reach 5 billion words in July, 2012. It's taken only about 18 months more to add the second 5 Billion. These 10 billion words represent creative expression unleashed. And they represent a lot more. Let's assume it takes the typical writer 9 months to write a book. The human heart beats 100,000 times per day. Each book was created with the life force of about 27 million heartbeats. The Smashwords catalog of 288,000 books represents about 7.8 billion heartbeats. Wow. Assuming 9 months to write a book, it would take a single individual 216,000 years to write this many words. Let's assume the average word in a sentence in print, including the space that follows it, is about 3/8 of an inch long (wild guess!). These words would stretch 312 million feet, or about 60,000 miles (96,000 kilometers), or long enough to wrap the earth almost 2 1/2 times. Smashwords was launched six years ago. Since then, every writer in the world has had the ability to self-publish a multi-format ebook at no cost through Smashwords and other platforms. Imagine the creative output ebook self publishing has enabled these last few years, and imagine what's yet to come. Imagine the number of literary classics that have been birthed over the last few years - classics that might not be recognized as such for years to come. I'm blown away by the scale of these numbers, and I'm humbled these 87,000 authors, small presses and literary agents have chosen to partner with Smashwords to help realize their books. Is Self Publishing Good or Bad for the Culture of Books? There's been a lot of hand wringing lately in some circles that self publishing is enabling a deluge of low-quality books. These people are missing the point of self publishing. Self publishing gives writers the freedom to decide when they'll graduate to become a published author. The gatekeepers are replaced by readers. Gone is the myopic, suffocating filter of perceived commercial merit by which traditional publishers judge and reject books. I've got enormous respect for the people of publishing, but their business model, and their value system for books, is off-kilter and out of date. Prior to the rise of ebooks and the rise of indie authorship that ebooks enabled, the business of big publishing had become hazardous to books and book culture. Why? Because books cannot and should not be valued by sales or estimated sales alone. These smart, well-intentioned people in publishing were forced to play a blindfolded grim reaper by guessing which books readers didn't want to read. And then they threw the surviving spaghetti against the wall and let readers decide. A reader can't accurately tell anyone what they really want to read until they read it, in the same same way I didn't know I wanted to listen to Nirvana's Smells Like Teen Spirit until I heard it. The best creative works break preexisting molds and surprise us. What about the spaghetti that never made it to market, and that would have stuck if only given the chance? What about the hundreds of thousands of fine traditionally published books that were forced out of print weeks after release, before they had a chance to be discovered by readers? Many of these books will never see the light of day again. Consider the millions of writers who've had their dreams crushed over the last couple hundred years because their books were rejected when publishers didn't recognize their value. Virtually every literary classic today has a story of how it was almost not published. Imagine the thousands of literary classics - classics that would have surpassed anything ever published - that died with their authors, tossed out with the attic trash. This tragedy no longer needs to be repeated, because the world of books is no longer constrained by a broken business model that is unable, unwilling and disinterested to take a chance on every author. I founded Smashwords so I could take a chance on every author. To reject rejection. I wanted to give writers the freedom to publish and readers the freedom to read what they like. Writers recognize that success cannot be measured by dollars alone. There are spiritual and emotional pleasures to be had by self publishing that only writers can understand. Now back to the critics who complain about the torrent of crud enabled by self publishing. Yes, self publishing will enable more poor-quality books than ever before. But so what? The flip side of this coin is that self publishing will enable more better books than ever before. You cannot grow wheat without chaff. 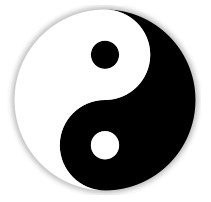 Yin and yang. More better books is what matters most. More diversity. More choice. More freedom to publish and freedom to discover and enjoy. Online book discovery systems are amazingly adept at burying the crud and surfacing the creme. The books that are truly horrible - books released by writers who failed to honor their reader with a quality read - quickly become invisible because readers will reject them today and in the future. The great books - the ones that take readers to emotionally satisfying extremes - will always find readers and bubble up to visibility, if not today, then next month or next year or next decade. Great books are more discoverable today than ever before. The retailer discovery algorithms do an incredible job of capturing, measuring and leveraging the collective wisdom of readers as they browse, sample, purchase, read, review and talk about these books. As capable as the book discovery algorithms are today, they'll only grow smarter in the future. Fear not, dear booklovers, self publishing will not only improve publishing, self publishing will save publishing. Congrats to all Smashwords authors. You are improving the world of books one word and one indie ebook at a time. Thanks for allowing all of us on the Smashwords team to join you in this transformative adventure. The "torrent of crud" comment always is comical, coming from an industry that seems intent on bringing out one tedious celebrity memoir after another. My heartbeats are included in the 7.8 billion heartbeats that made 10 Billion Words! So Awesome! Thank you Smashwords for this amazing choice that you've given to us self-publishers. Hooray for authors AND for Smashwords! So much better than the McDonald's sign. Now we need to improve reader awareness. 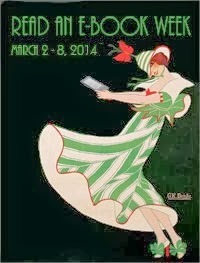 When is Read an eBook Week this year? I'd like to give that week a head start on my blog. "My crud can stand up to the best of them!" Great work, Smashwords. I've always found you to be helpful and simple to use. Over the past few years my clients have benefited greatly from uploading their books to Smashwords. 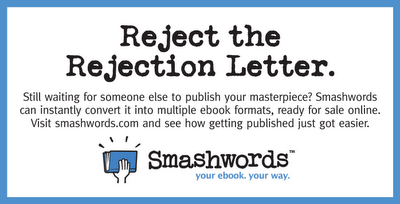 I loved that phrase, "to reject rejection" and though I am not a Smashwords author, I heartily applaud the achievement and hard work of so many. Dreams meant to come true, and yet, learning a few minor skills would make all the difference. Self publishing is wonderful, but writing is work, and it takes more than typing a few words on the page, to create a book. Writers need to edit and proofread their work, before it's published. They need to take pride, just like you do with Smashwords. True success takes work and lots of effort. It doesn't happen by chance. Writers need to remember this, especially when they're publishing their books for anyone to read. Also something people forget to take into consideration with their books is presence - you have to exist somewhere. just posting a book - even an amazing book - and thinking it will make millions won;t work. Readers can;t share the great news about your book if they have never heard about it. The trouble is maintaining a balance between new material and some promotion. 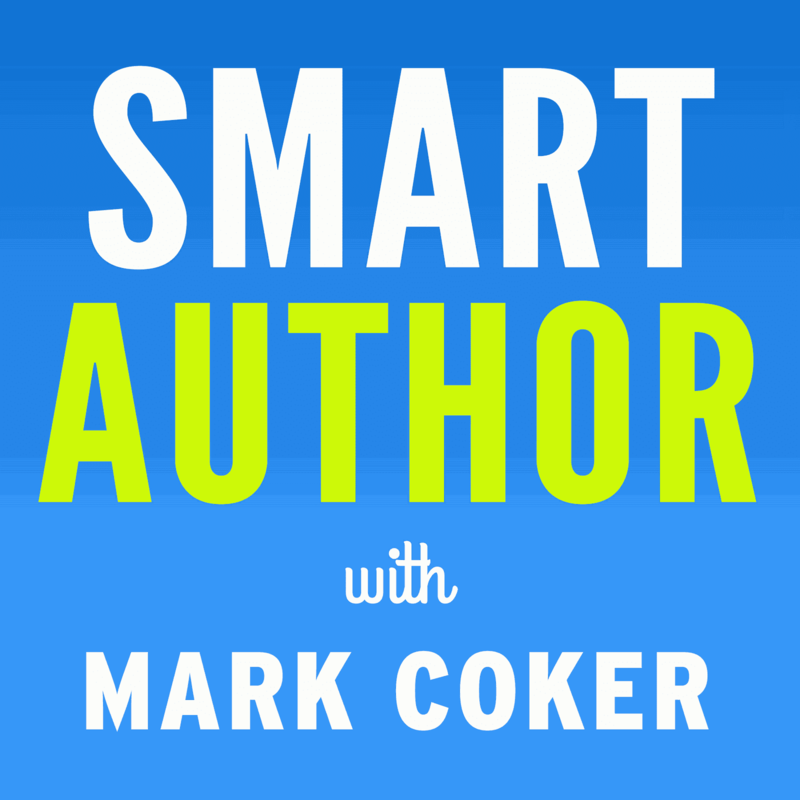 I applaud Mark and smashwords in providing a remarkable service to both authors and readers alike!